Fair warning: It may be tough to find some of the 2019 Whiting Award winners on the shelves of your local bookstore. Most of the emerging writers have little more than a single widely published book to their name. A couple of them don't even have that. But what the 10 new Whiting recipients lack in publishing credits and international awards, they more than make up for in talent and promise — at least, according to the prize's judges, who are bestowing $50,000 on each of them in the hopes of giving the winners "a first opportunity to devote themselves fully to writing, and the recognition has a significant impact." The winners announced at a ceremony Wednesday night in New York City, listed in alphabetical order, are: poet Kayleb Rae Candrilli, poet Tyree Daye, novelist Hernan Diaz, playwright Michael R. Jackson, nonfiction writer Terese Marie Mailhot, nonfiction writer Nadia Owusu, short fiction writer Nafissa Thompson-Spires, novelist Merritt Tierce, poet Vanessa Angélica Villarreal, and playwright Lauren Yee. "Every year, our corps of expert anonymous nominators point us to some of the most exciting and vital work happening today," Courtney Hodell, who oversees the awards, explained in a statement released Wednesday. 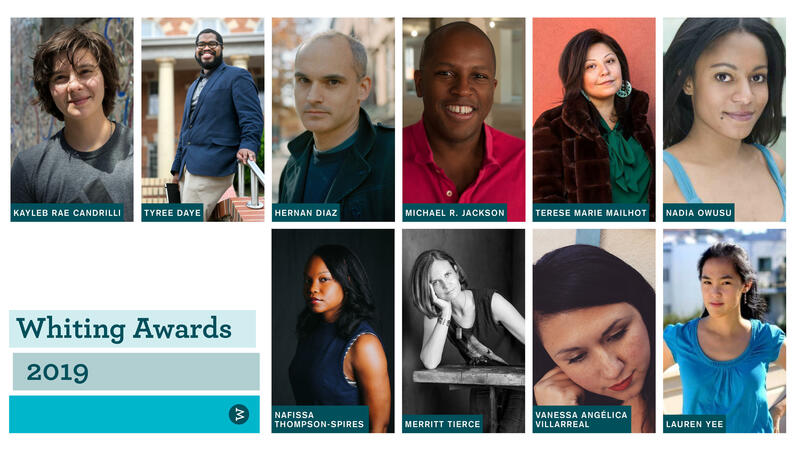 "These names may be new to us, but they're writing the future of literature in this country." If the names above are a little difficult for the average reader to recognize, the names on the list they're joining — the list of winners dating back to the prize's inception in 1985 — share no such issue. Colson Whitehead, David Foster Wallace, Lydia Davis, Jonathan Franzen and Tracy K. Smith, among many others, won the Whiting before going on to see their dust jackets featured in bookstore displays around the world. With that in mind, here are some brief introductions to this year's winners, paired with what the Whiting judges had to say about their work. Kayleb Rae Candrilli's memoir in verse, What Runs Over, is a portrait of an upbringing in desolate rural Pennsylvania that — according to Whiting judges — evinces "savage grace as it lays bare the violence and isolation of a trans person's coming of age." The judges explain that Tyree Daye's River Hymns, a poetry collection, offers "pictures of a river life are strung together in language that is clear, lucid, unexpected, and often unforgettable: image-making of the highest order." Hernan Diaz — whose debut novel, In the Distance, was a finalist last year for both the Pulitzer Prize and the PEN/Faulkner Award for fiction — sets out to explore "two kinds of wilderness: the immensely taxing newness of the American West and the still-forming interiority of a Swedish immigrant desperate to find a way back home." In a first for the Whiting, Michael R. Jackson has been recognized for his work in musicals. (Tony Kushner, a 1990 Whiting recipient, didn't write Caroline, or Change until after his win.) Jackson's work-in-progress, A Strange Loop, which premiers in New York City in May, "is robustly intelligent, unflinchingly honest, dizzyingly screwball, and a sheer delight." Terese Marie Mailhot, a First Nation Canadian writer, took on her own life story in a debut memoir, Heart Berries, that bears "a fierce and unyielding commitment to creating an unlikeable — which is to say, fully human — female narrator." Nadia Owusu's debut nonfiction book hasn't even been published yet, but the urban planner's lyric essay chapbook, So Devilish a Fire, caught Whiting judges' attention nevertheless. They describe it as a "profound meditation on rootlessness, hybridity, and resilience." This may well be one name literary awards watchers recognize: Nafissa Thompson-Spires. Her short fiction collection Heads of the Colored People was longlisted last year for the National Book Award and shortlisted for the Kirkus Prize. Judges say she writes with a "bold new voice — young, gifted, black, unafraid of its own contradictions, and powerful enough to take the writer anywhere she wishes to go." Judges described Merritt Tierce's debut novel, Love Me Back, as "clear-eyed, dark-hearted, and mordantly funny." The author was honored on the National Book Foundation's 5 under 35 list in 2013. In her book Beast Meridian, judges say that poet Vanessa Angélica Villarreal deploys lines that "blaze with anger and sympathy" in a work that places readers in a "porous border world of dual (or multiple) identities." Playwright Lauren Yee, who is among the most prolific of the 2019 recipients, "examines the legacy of the Khmer Rouge in a play [Cambodian Rock Band] that also takes on the dynamics of father/daughter relationships and the joyful legacy of Cambodian pop music."